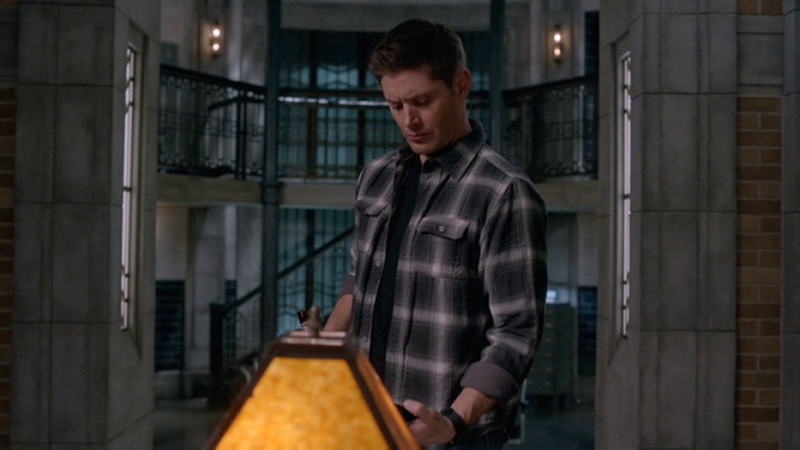 Dean acquires yet another plaid shirt in S9. This one is a broad charcoal and grey plaid with grey buttons. In Stairway to Heaven (9x22), Dean wears this shirt from when he starts interrogating Cas’ angels to find the truth behind the suicide bombings until the end of the episode. In Do You Believe in Miracles (9x23), Dean continues to wear it for the entire episode. In Girls, Girls, Girls (10x07), this shirt has been laundered well. Dean wears it when he and Sam go to the hotel to track down Rowena. In About a Boy (10x12), Dean wears this shirt at the end of the episode when he and Sam see Tina off at the bus station. In Inside Man (10x17), Dean is wearing this shirt at the end of the episode, when Sam gets home from his secret mission. In Dark Dynasty (10x21), Dean wears this shirt in the Bunker once they get back from Omaha. He keeps it on until the end of the episode. 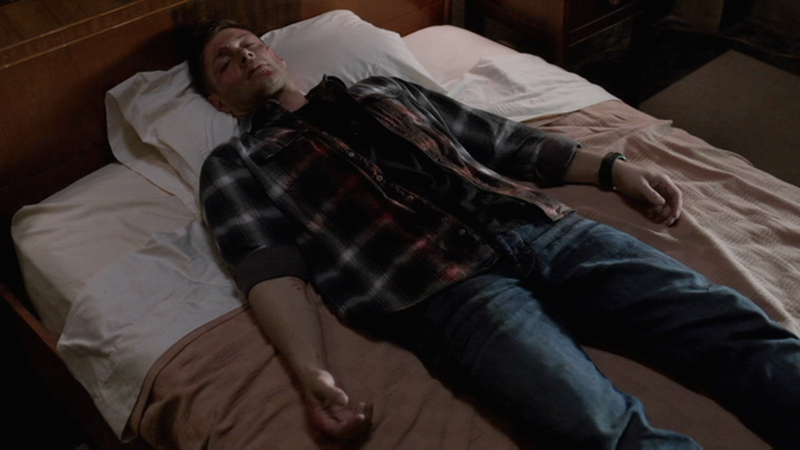 In The Prisoner (10x22), Dean is still wearing this shirt at Charlie’s funeral. FATE: It gets severely blood stained when Dean is slain by Metatron while wearing it, in Do You Believe in Miracles (9x23). Oh, I really like that shirt. It's too bad it has such a bad memory attached to it. And the blue jacket is also a favorite. I hope someone burned that shirt. Yeah, it's a nice one. Dean looks really good in charcoal. But yeah, not sure if it shows up again in S10, I haven't been playing close enough attention. Hi, as I've said before - if it's not in the post, I don't know it.